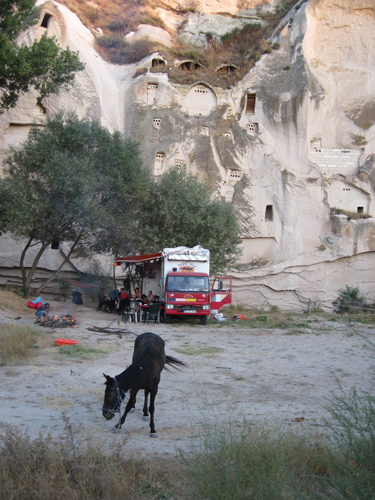 Exploring the "Land of the Beautiful Horses" on a Cappadocia riding vacation in Central Turkey. The boarding call came over the loudspeaker. My plane was boarding for Istanbul, where I would catch a connecting flight to Kayseri, and then be picked up for my horseback holiday in Cappadocia. My long-awaited dream of going to Turkey was finally being realized. Turkey’s unique location between Europe and the Middle East makes it unlike any other place on earth. One of the oldest continuously inhabited regions in the world, its history and geological formations render it a distinct destination. Turkey is the land of Homer, the cradle of so many religions, and an area of epic influence on the Greeks, the Romans, the world. After a 10-hour flight, we began our descent into Istanbul. Lower and lower we dropped, and all we saw was water. Istanbul sits on a spit of land between the Black and Aegean Seas, and it began to appear as though we would be landing on one of those seas! Finally, just when we were all sure we were about to go for a swim, Istanbul appeared–– magical, mysterious Istanbul. Unlike many other places, travel in Turkey is experiential. Travelers are not removed from historic sites by endless miles of thick rope and barriers. They can walk inside, touch, and even sit on a structure from the 11th century. Antiquity in Turkey is just part of life. Cappadocia is known throughout the world for its underground cities, unique rock formations, and ancient churches carved into hillsides and caves. For two decades I had dreamed of seeing the underground cities and unique geography and viewing historical sites that I had only encountered in books. And what better way to do it than on horseback? The Akhal-Teke Horse Riding Center, located in Avanos, is uniquely situated in the heart of Cappadocia, just the region I wanted to see. 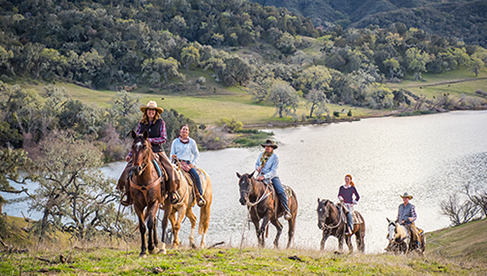 Owned and operated by Ercihan Dilari, the center keeps a string of fit, forward going, and sure-footed horses that handle the terrain and long rides easily. Rides are available for everyone from beginners to the most experienced, but riders need to be sure to honestly state their riding experience in order to be matched with the appropriate mount and tour. I had been introduced to the center by my friend, Susan Wirth. Susan had already taken several tours, and highly recommended it. I chose the Fairy Chimneys Tour, as it covered all the bases for what I wanted to experience in Turkey. It included a tour of an underground city, went right through many of the exquisite geographic formations, and took us to ancient historical landmarks. Some nights we returned to the center, spending the night in the charming Sofa Hotel, while other nights were spent camping in surely the world’s most unusual campsites, such as at the foot of a fairy chimney! My riding partners included Elizabeth and Holly (a mother and daughter from Great Britain), Susan (from Massachusetts), and Ann from New Zealand. Ann was clearly in love with both travel and horses. Her enthusiasm and energy were fabulous. Ercihan seemed to be part of the landscape, so surely did he know every inch of it. Not only does he ride and train, but he has to be his own vet (with telephone help from a vet in Istanbul), farrier, and horse dentist. To run the type of establishment he has, and be out in the country so far from everything, he needs to be capable of doing just about anything the horses might need. Many times I awoke early to hear him tapping on a shoe that had come off. Our rides ranged from leisurely walks with everyone chatting and snapping photos of the vistas and landscapes, to exhilarating gallops uphill to the top of a mesa. Taste buds that have been napping for a lifetime awaken in Turkey. Fresh, vital, vibrant foods and flavors await you. The Turkish people do not tolerate bad food. From Turkey’s volcanic soil springs a bounty of melons, grapes (there are vineyards everywhere in Cappadocia, sprouting from impossible substrates that resemble coarse gravel), tomatoes, cucumbers (with flavor! ), beans, figs, limes, eggplant, pistachios, and orchards of peaches, pears, apples and plums. On the remotest mesas with no signs of civilization in sight pumpkins and squashes grow everywhere. The sweetest blackberries in existence grow thick along the trails. The bushes overpopulated with deep, dark, luscious berries. Every ounce of arable land is used in Turkey, and plenty of land that doesn’t seem to have a remote possibility of being arable is used as well. Lamb is a staple here, and chicken is very popular. But not chicken like you’ve ever known it. Cooked in a clay pot with tomatoes, onions and potatoes, or over a campfire covered in a large metal can, it comes out moist and bursting with flavor. A favorite for all of us was böreg, a bit of cheese encrusted with phyllo dough and cooked to crispy perfection. It could be breakfast. It could show up as an appetizer at dinner, but it was always welcome! Cappadocia means “land of the beautiful horses.” The region was at one time known for its Akhal-Tekes, a hot blooded breed native to Turkmenistan and descended from the now extinct Turkoman horse (believed to be one of the founding stallions of the Thoroughbred, the Byerley Turk). Akhal-Tekes are reputed to be the oldest domesticated breed of horse. Although currently the Akhal-Teke Horse Center primarily uses Arabian and Anatolian horses, plans are in the works to once again populate the barn with Akhal-Tekes. Our horses were decked out in “Turkish bling,” wearing beads around their necks, while my stirrups sported inlaid pink crystals. The center of the horses’ beads contains an eagle, protecting them from harm. The horses were incredibly fit, and reassuringly sure-footed. Much of the ground covered during the rides was either seemingly straight uphill, on footpaths barely wide enough for a deer edging steep canyons, or down treacherous slopes of loose sand and gravel. This is not a trip for the faint of heart. At one point our guide Ercihan pointed to the very high top of a mesa girded with sizable rock outcroppings. “We’re going up there?” I gulp. What a surprise to reach the top and find it perfectly flat, farmed with hayfields and vineyards. Turkey is a fabulous place to ride because of the freedom granted those on horseback. No fences hold riders in—or keep them out. 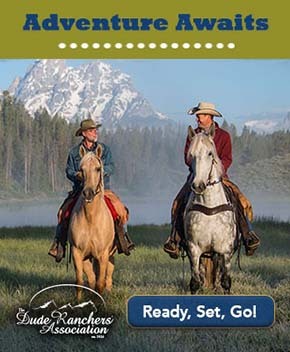 It is wide open and horseback riders are allowed virtually anywhere, from open steppes and mesas to riverbanks and the cobblestone streets of villages. In the village of Mustafapasa (formerly an ancient Greek village known as Sinasos), we spotted an art museum as we were riding by. We all wanted to go in. No problem. Tying the horses in the street to whatever handy pole or post we could find, we trekked inside to view the exhibits. We were also treated to delicious pomegranate tea on a second story open tea room, where we had a beautiful view of much of the village. Cars and trucks drove by the horses, but drivers and horses alike remained calm and unruffled. Turkey emerged into the modern world thanks to its first president, Mustafa Kemal Atatürk, who recognized the country’s need to leave behind the distant past it still clung to and bring itself into the 20th century. Atatürk distinguished himself in World War I during the infamous battle of Gallipoli, and then succeeded in creating a coalition to drive the occupying Allies out of the country. A new Republic of Turkey was formed on October 29, 1923, officially ending 623 years of Ottoman rule and government by the Sultan. Thanks to Atatürk, Turkey modernized their educational system and industry, and developed a secular, representative system of government, as well as established legal equality between the sexes. (Turkish women received the right to vote in 1934). An extensive rail network was also created during his 15-year rule. One of Atatürk’s many advances was a system of irrigation and drinking troughs throughout the country, which in practical terms allowed us the luxury of riding wherever we wanted without any worries about where to find water. Atatürk is idolized for his vision, for his ability to create a modern country that continues to grow and thrive today on the foundations he laid. Statues and pictures of him adorn villages and buildings throughout the country. Five times a day, the call to prayer is heard in Turkey. It is a call that can be heard everywhere, no matter how remote the mesa or valley you may be in. The enigmatic sound is not only heard, but felt through its quavering vibration. There was no doubt: we were not in Kansas anymore. The Turkish people are incredibly friendly and generous. Everywhere we went, villagers came out to bring us bunches of grapes from their vineyards (every house seems to come with its own personal vineyard), or apples for our horses, or fat red tomatoes that created instant bliss when eaten. Part of the route we took ran along the Kizilirmak River, the longest river in Turkey. Dramatic vistas and ancient dwellings confronted us at every turn. We visited Sarihan, a 13th century caravanserai (rest areas for camel caravans) located along the Silk Road. These “rest areas” were placed approximately every 80 kilometers along the Silk Road, with smaller ones halfway between. The famed fairy chimneys of Cappadocia are truly amazing, Lord of the Rings come to life. Homes are created in fairy chimneys, and few things are more comical than a fairy chimney sporting a porch or a flowerbox. 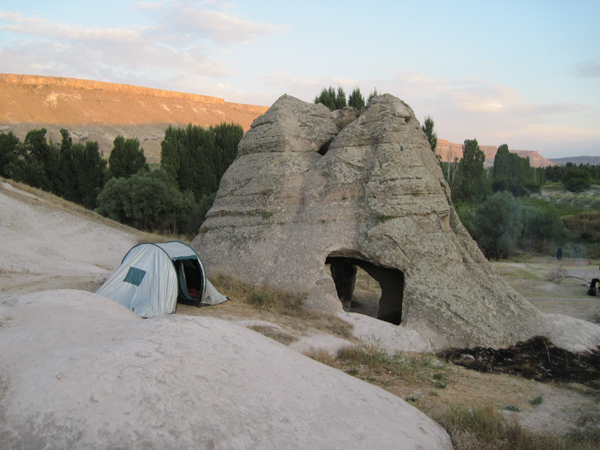 Part of our trip was spent camping, and one of our sites put our tents directly in the midst of a cluster of fairy chimneys. Cameras clicked all around, for who could imagine a more unique campsite anywhere? Hot air balloons are tremendously popular in this area, and more than 100 balloons may be afloat at a time. Though it sounds crowded, there is little danger even if they bump into one another, and the sight of all the brilliantly colored balloons hovering over Cappadocia’s unique topography is nothing short of spectacular. Our many hours in the saddle required snacks to sustain us, and Turkey easily rose to the task. We would just nip into the endless small orchards and pick an apple, an apple-shaped, dimpled pear that tasted like nectar, a juicy, heavenly peach, plums, grapes, and walnuts. Tea breaks were also a treat, although many indulged in dark, sweet Turkish coffee. We were well cared for throughout our journey by Serdar Tug and Mehmet Sibik, who met us at the campsites, bringing our luggage, setting up camp, and feeding us fabulous meals, including dinners cooked over the campfire. Serdar and Mehmet appeared to be mind readers, appearing with a cup of tea or a glass of wine, or whatever you were just thinking you needed to make everything perfect. I had been thinking about how nice it would be to lounge in a hammock toward the end of one ride; when we got to camp the first thing I noticed was a hammock strung between two trees! I lived my dream of exploring an underground city when we visited Özkonak. It’s astounding that these “cities” were carved out of stone, and provided everything necessary for living, such as ventilation, food storage, wine cellars and water systems. As many as 3500 people lived in the largest cities! Two of the specialties of the village of Avanos, where we stayed, were pottery and Turkish rugs. Avanos has been a pottery center for 4,000 years, something I found hard to fathom coming from a country with a history of only a few hundred years. We were treated not only to shopping expeditions for these area specialties, but a complete tour and education as to how they are created at local Bazaar 54. Ninety percent of Turkish rugs come from Cappadocia, where they are handmade locally with the colors and patterns varying according to the area. The rugs began as silk cocoons that were boiled to unravel a single filament, then the threads were dyed (with natural dyes from such items as walnut shells, mistletoe, and saffron), and then woven creating rugs in a huge range of colors and quality. Fine silk rugs were literally works of art, with their lustrous sheen and colors that changed as we walked around them, much like the colors of the Grand Canyon. This method of creating rugs by hand from silk is a tradition that has continued for 5000 years. The pottery, too, varied in quality depending upon whether it was ceramic, or quartz, but the colors were all brilliant. At Firca we were treated to the same education as we walked through the process of creating fine pottery. Some patterns are typical Turkish ones, while others are one of a kind, with the artist allowed free rein to his or her imagination. We visited the Greek Orthodox monastery of Keslik, dating from the 9th and 11th centuries. Ancient frescoes graced the ceilings, and yet more ancient—Greek graffiti! The caves and tunnels went on endlessly and we embraced our inner children and ran amuck, exploring every room and cave we could get to. A trip to a Turkish bath for a traditional “hamman” proved relaxing and beneficial to stiff muscles after hours in the saddle. Lying on heated tiles and being covered and massaged with oodles of bubbles was sublime; being rubbed vigorously with a rough cloth seemed just a bit too harsh. On the final day we visited the open air museum of Göreme, a UNESCO World Heritage Site, consisting of a vast monastic complex with each monastery hosting its own rock-cut church. Stunning frescoes (some with the brilliant blue of lapis lazuli) graced the ceilings. These monasteries ranged from the 10th to the 12th centuries (hence the term “New Church” used at one point ironically meant one from the 12th century). The only jarring note in a visit to Turkey was the litter. There appears to be no systematized approach to the pick up of garbage in the villages, and it is quite a distraction to see so much plastic packaging and other garbage in the streets, yards, and riverbanks, and marring the stunning landscape. But don’t let that stop you. Turkey is a land of spectacular vistas, amazing history, delicious food—and those beautiful horses. I’ll be back. When and How You Can Go: The best times to ride in Turkey are the spring and fall (their seasons correspond to ours in the U.S.). The weather is generally warm, usually in the 70’s during the day, but can get quite chilly at night. You do need a Visa, but this can be obtained quickly and easily at the airport in Istanbul. The price for an airport Visa was $10 at the time of this article's publication. There are various rides available, many of them shorter, and some that don’t require any camping. There are also activities available for non-riding partners. 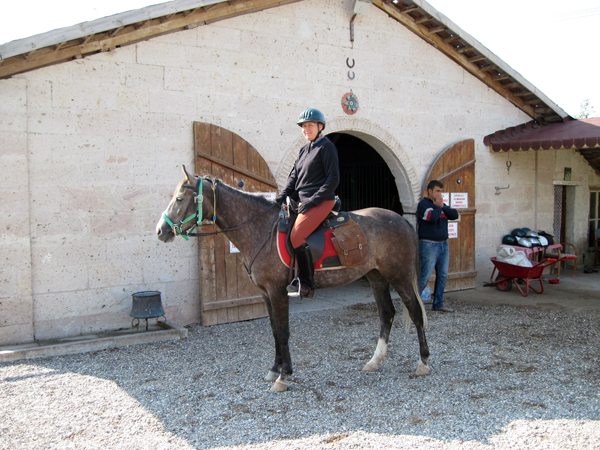 For more information on riding in Cappadocia with the tour operator that author Ann Jamieson used, contact www.akhal-tekehorsecenter.com. 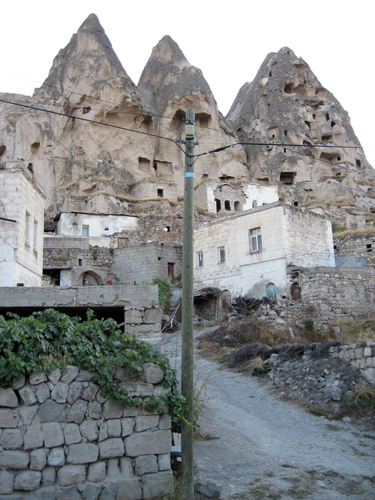 Also, check out the Cappadocia, Turkey riding vacations through EquitrekkingTravel.com. About the Author: Ann Jamieson is a United States Equestrian Federation judge licensed in hunters, jumpers and hunt seat equitation. She is the author of the popular book series For the Love of the Horse. The books are amazing collections of true stories about horses which have received rave reviews from readers and reviewers. The stories cover all breeds and disciplines, and everything from back yard ponies to Horse of the Year winners. Ann particularly enjoys showcasing rescues. Several rescue horses (Chester Weber's Jamaica, top show hunter Monday Morning, and Boyd Martin's Neville Bardos, all rescued from slaughter) have gone on to become Horse of the Year! Ann shows her own horse, Fred Astaire, in hunters and First Level dressage and enjoys retraining off-the-track Thoroughbreds for new careers. Fred Astaire is a grandson of Secretariat, and very proud of it! Ann lives in Kent, Connecticut, and shares her home with two very entertaining Ocicat kittens. She also keeps and breeds tropical fish. One of the fish she bred won “Best of Show” (yes, they do show fish!) at her very first tropical fish show.